WASHINGTON, DC – A new report released today by the Center for International Policy reveals the unsettled state of America’s post-9/11 border security policy, highlighting the flaws of the United States’ conflating counterterrorism strategy, the war on drugs and immigration enforcement in our border policy. 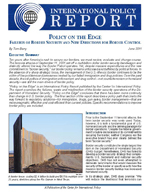 Written by TransBorder Project director Tom Barry, the timely report, "Policy on the Edge: Failures of Border Security and New Directions for Border Control" (PDF | HTML), examines how despite massive expenditures towards the renewed commitment to “border security” after 9/11, U.S. border policy remains unfocused and buffeted by political forces. In the absence of a sharp strategic focus, the management of the U.S.-Mexico border continues to fall victim to the problems and pressures created by failed immigration and drug policies. “Like the ill-considered invasions of Iraq and Afghanistan and the ‘global war against terrorism,’ the post-9/11 border security buildup has drained our treasury while doing little to increase our security,” says Barry. According to "Policy on the Edge," the border security framework has fostered alarmist politics about border threats and wasteful spending. "Absent necessary strategic reflection and reform," writes Barry, "the rush to achieve border security has bred dangerous insecurities about immigration and about the integrity of our border, while giving new life to the flagging war on drugs at home and abroad." Barry concludes, "Bankrupt and without strategic direction, it is time to rein in the border security bandwagon and to establish new regulatory frameworks for U.S. border policy." The report recommends a new policy framework that charts the way forward through regulatory solutions—for immigration, drugs, gun sales, border management—that are more pragmatic, effective and cost-efficient than current policies. Set forth a new vision of pragmatic immigration reform that is not conditioned on the ambiguous notion of border security. The full report is available on the Center for International Policy's website (PDF | HTML).